An entertainment in Vauxhall Gardens in about 1779, by Thomas Rowlandson. It is difficult nowadays to quite recapture the glamour, fascination and sheer bravura of Vauxhall Gardens in the heyday, partly because they were such a heady mix of genres. The music performed at the gardens has often been somewhat looked down on by commentators, but Bridget Cunningham and London Early Opera's valuable Handel in Vauxhall CDs [see my reviews of disc 1 and disc 2] have revealed the remarkable range of the programmes. For their appearance at the London Handel Festival on Wednesday 4 April 2018 at St George's Church, Hanover Square, Bridget Cunningham and London Early Opera presented Handel's Vauxhall Pleasures, a recreation of the sort of programme visitors to the gardens might have expected with music by Handel, Thomas Arne, Thomas Gladwin, John Hebden, William Boyce, John Worgan and Frederick Lampe, performed by Claire Bessent, Eleanor Dennis, Miriam Allan, Charles Macdougall, Greg Tassell and Benjamin Bevan. 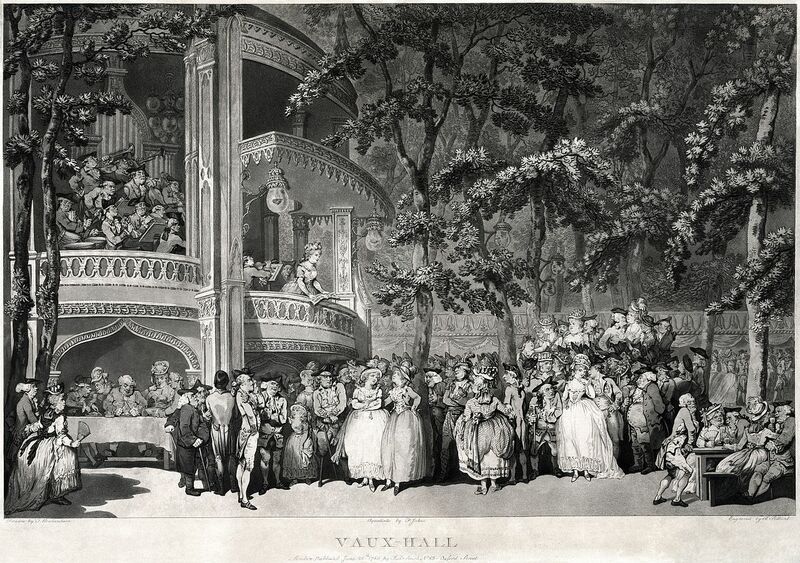 But this was much more than a musical entertainment, behind the performers was a large screen on which displayed a changing selection of images of the period - paintings, drawings, engravings and even maps - which evoked the magic of Vauxhall, and of course not forgetting Roubiliac's statue of Handel. And to put things in context there was a linking narration from Lars Tharp, part modern commentator and part period diarist. Whilst the orchestra played Handel's 'Air' from The Water Music, Thrap read a description of the magic of arriving at Vauxhall and we saw matching images and maps. The programme was typically varied, so there were meatier items such as Handel's Organ Concerto Op.4, No. 2 (with Daniel Moult playing the Handel House Organ), the Concerto for strings and basso continuo no. 1 in A major by John Hebden who was a member of the Vauxhall orchestra (this piece was quite a discovery, full of richly imagined textures using two solo violins), and Handel's Comus (Handel in pastoral mode and a neat link to Milton who was also commemorated in the gardens). Novelties included an Hornpipe that Handel wrote for Vauxhall, lighter songs by Thomas Gladwin and William Boyce, plus Thomas Arne's charming pastoral Colin and Phoebe (Arne was the gardens' musical director). There was also the more familiar, such as Benjamin Bevan's delightful turn as Polyphemus in 'O ruddier than the cherry' from Acis and Galatea, and the second half opened with 'As steals the morn' from Handel's L'Allegro (finely sung by Eleanor Dennis and Greg Tassell) which aptly captured the enlightenment spirit of the gardens. We ended in an elegiac mood with Lampe's charming Farewell to Vauxhall (sung by Greg Tassell) and 'The Dead March' from Saul (which was played at the gardens on the anniversary of the founder, Jonathan Tyer's death). But the final item was in more rousing style, with Handel's surprisingly catchy A song on the victory over the rebels by his Royal Highness the Duke of Cumberland, complete with audience participation in the final choruses. The singers all entered into the spirit of the programme with a will, Greg Tassell even sported a tricorne hat. Not every singer managed to get the words over completely, but with Greg Tassell and Benjamin Bevan, we certainly had no recourse to looking at our printed word sheet. Lars Tharp's narrations, by turns entertaining and informative, were perhaps slightly too long. But they set the scene admirably and included some lively contemporary descriptions. This was an imaginative evening, combining music, spoken word and images to evoke the magic of Vauxhall. The evening was based on a significant amount of research, all underpinning a delightful couple of hours.